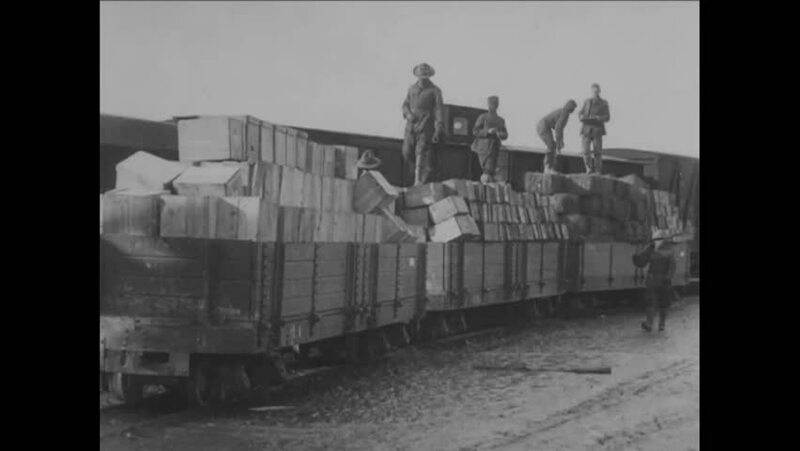 CIRCA 1918 - Soldiers move out on a train loaded with provisions. hd01:05CIRCA 1943 - The USS Enterprise comes up to a dock. 4k00:201940s: View of factory, crane lifting materials. Pan across factory. hd01:40CIRCA 1910s - A field telephone switchboard is examined in the 110th Field Signal Battalion and 90th division troops drink captured mineral water. hd01:00CIRCA 1920s - Cranes are used to transport beets from ships to the dock. 4k00:111930s: People board boat. Crowd on dock. hd00:241940s: Man and boy ride dog sled out of village, wave to people they pass. Graveyard of abandoned village.